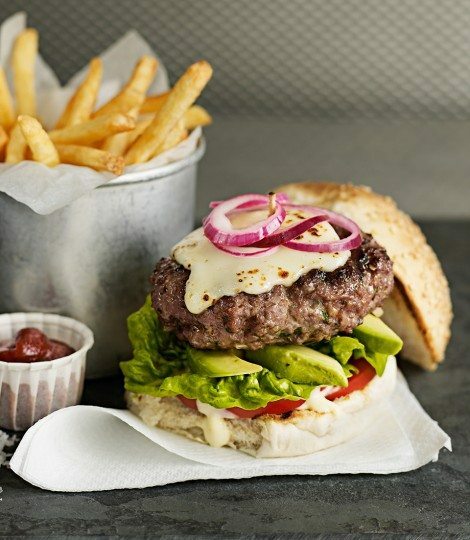 Whether you are planning a BBQ, fancy a treat, or if you simply want to cook the family something delicious, celebrate national burger day on the 23rd of August and follow this simple recipe using our mince beef for a tasty treat! Feel free to send us in your burger masterpieces on our social pages! 1. lace all the ingredients for the burgers in a large bowl. Season and mix well. Cover and chill in the fridge for 1 hour. 2. Using wet hands, shape the mixture into 8 burgers. If you want to cook them straight away skip to step 4. 3. If you are freezing them; place flat between sheets of baking paper in a rigid freezeproof container. Freeze for up to 3 months. When ready to use, defrost the burgers completely in the fridge; this will take 3-4 hours. 4. Heat a griddle pan or barbecue to hot. Brush both sides of the burgers with oil and cook for 3-4 minutes each side or until well browned and cooked. 5. Meanwhile, preheat the grill to medium hot. Top each burger with a slice of cheese and grill for 2 minutes until bubbling. Toast the burger buns until lightly golden. 6. Mix the mayonnaise with the mustard and spread over the base of each bun. Add some tomato, lettuce and avocado slices, then the burger, red onion slices and the other half of the bun. 7. Serve with a small bowl of ketchup and fries to complete your burger masterpiece!